What we are about to tell you is not conspiracy theories or based on rumours and suspicion. These are all facts that have been uncovered in scientific journals and through various investigative journalistic exposés. The truth is never easy to hear and the biggest and most popular commercial dog food companies have been or are guilty of these atrocities against our trust and our beloved pets. We recommend that if you are a sensitive reader, you should stop immediately. Livestock and poultry waste. Supermarket rejects. Heads and hooves. Euthanized cats and dogs. Even a few dead rats that’s attracted to the unhygienic piles with flies buzzing around. All waiting to be loaded by mini-dozers and processed. This is probably not what you have in mind when you are looking at the protein and fat ingredients on the label of your dog food brand, but this is sadly a reality. Manufacturers, slaughterhouses, grocery shops… they are all businesses that contains an element of “waste”. They are also businesses focusing on the bottom line and trying to minimise expenses. This “waste” usually ends up at animal feed factories. A lot of this “waste” contains various contaminants. Things like pesticides, fish oils that contain high levels of mercury and other heavy metals. Antibiotics and other pharmaceuticals that are found in euthanized animals. That which most closely resembles decent portions of meat is already spoiled. The reason why this “waste” is a big expenditure problem for businesses is the fact that it is illegal to sell these products to humans. But they can still manage these expenses by legally selling it to dog food manufacturers. We are enticed by big and popular dog food brand packaging and the marketing promises they make. We buy into the promotional proclamations of “beef”, “chicken” and “fish”. But what the consumer doesn’t know is that what we perceive as nutritious protein are meats with moisture contents of almost 75%. Labels display ingredients according to weight before being processed. After being processed 75% is lost, yet they don’t tell you that. 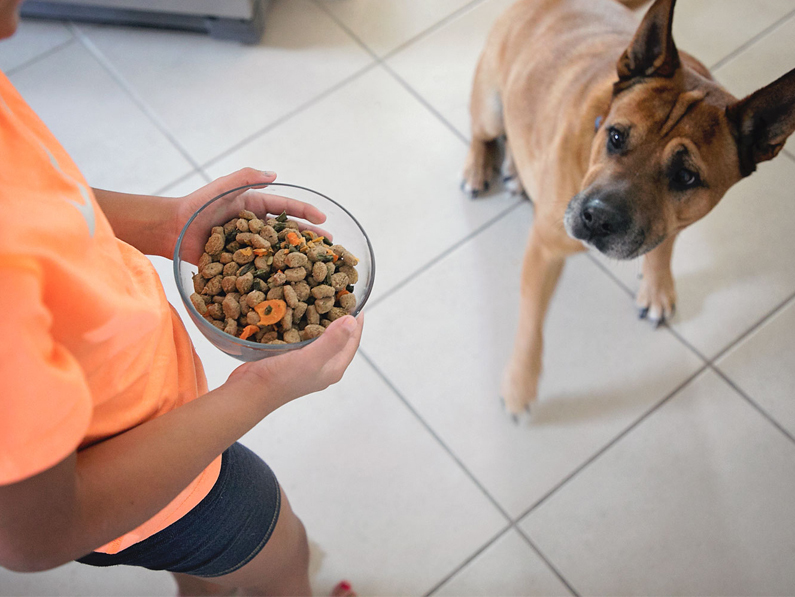 They still state that meat is the biggest ingredient, but in reality, it contains very little amounts of high quality protein that is substituted with ingredients such as wheat and soy – things not biologically suitable for your pet. They proudly state that they’ve added glucosamine (which is critical in the case of older dogs suffering from joint pains). In truth, veterinarians will tell you that the amounts are not sufficient enough to make any difference to your pet’s health. Labels also proudly display “with added omega 3 fatty acids”. That may be true, but the manufacturing process completely destroys them. So, is it any wonder why more and more people are switching to private and independent dog food manufacturing brands? Your pet needs a brand you can trust. So can you tell me more about TipTop and what is in your dog food?